An often overlooked focus of study and analysis in literary criticism is the cover of a novel. Indeed, a cover can be an important tool for understanding a literary work as well as the historical and cultural context from which that work or respective cover emerged. Deidre Gilbert, in her article “From Cover to Cover: Packaging Jane Austen from Egerton to Kindle,” details the long history of covers and bindings that have encased Jane Austen’s work, showing, among other things, the sheer volume of copies in existence. Her article is an endeavor in contextualizing the covers of Austen’s works, with consideration to these main items: contemporary literary taste, cover design history, publishing practices, and audience. The scope of Gilbert’s project is broad as she delineates the binding of the first edition of Austen’s Pride and Prejudice and concludes her article with a discussion of the advent of the kindle. I will conduct an investigation similar in nature to Gilbert’s, but with a much more limited focus, analyzing what the cover of Bloomsbury Classics’ 2006 edition of Jane Austen’s Pride and Prejudice suggests about contemporary literary taste, publishing practice, and audience. I argue this cover of Pride and Prejudice foregrounds romantic concerns to situate the novel within the canon of “chick-lit” and market the novel to those loyal adherents of the canon. This marketing tactic is furthermore indicative of contemporary literary taste and the larger tendency of publishers to pigeonhole female authors. Pictured on the cover of the novel are two hearts: one large and one small. The larger of the two is yellow, while its smaller counterpart is pink and almost seems to be cozying up to the larger, yellow heart. 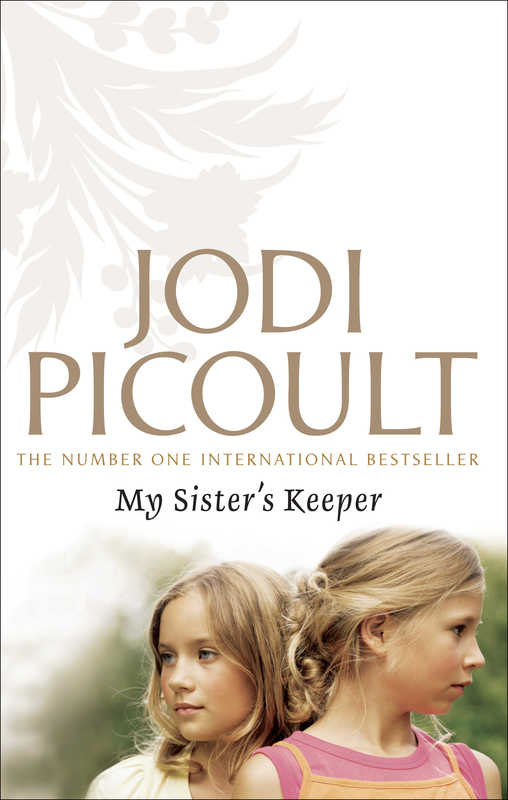 The hearts are imposed on a field of red and featured above them is the title and beneath is an advertisement for the foreword to the edition, written by Meg Cabot, the author of the epistolary novels The Princess Diaries. The foreword to the edition is called “Why You Should Read This” and begins with the confession, “I saw the movie first” (Cabot vii). The foreword explains that Cabot read the novel to satisfy her need to see more of Austen’s protagonist, Elizabeth Bennet. She exclaims that “one of the greatest joys in human history,” is found in reading “how sharp-witted Lizzy takes snobby Mr. Darcy down a few pegs” (vii). It seems Cabot’s interest in the novel is owed to Austen’s characters and their sharp wits, and she supposes that this may attract other prospective readers as well. Tucked away in the back of the novel is also an installment of a fictional periodical called “Extra! Extra!”, in which there is an “interview” with Jane Austen and blurbs of news events that occurred around the time of the original publication of Pride and Prejudice. In addition, the text on the back of the book makes little mention of any characters or plot points. Instead, Bloomsbury Classics summarizes Austen’s novel as being “one of the most heart-warming and entertaining tales of romance ever written!” In fact, more space is given to a description of Meg Cabot’s foreword and the installment of “Extra! Extra!” that follows the novel than the novel itself – the emphasis being placed on the packaging of the novel and how this copy is different from the myriad others. 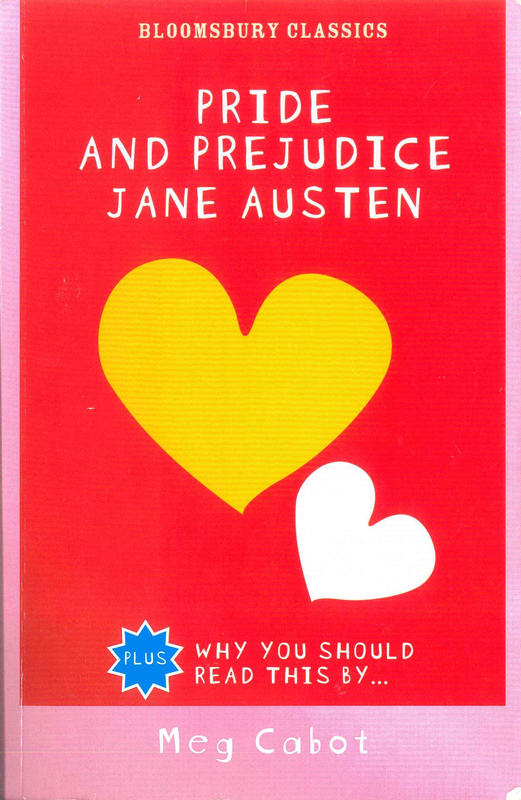 This cover art, and general packaging of the novel, suggests that Austen’s novel is a story of love and romance. The publisher does not disguise its intention of inflating the romantic concerns of Austen’s novel, with the archetypal image of two hearts that symbolize and foreground the romance between Elizabeth Bennet and Mr. Darcy. Though it can be accurately stated that the novel is a story of romance, it would be an injustice to Jane Austen to argue that it is her sole purpose to tell a story of courtship between two characters. The image of two hearts nestled closely to one another, the publisher’s description of the novel on the back page, and Meg Cabot’s foreword effectively convey the message that Austen’s main and only concerns are romance, true love, and witty banter between her characters. The color palete of the cover even contributes to this portrayal of Austen’s novel in that the colors, pink, red, white, and yellow, are those typically associated with love and romance. In emphasizing love and romance, Bloomsbury Classics places Austen’s novel within the canon of “chick lit,” and invokes Meg Cabot to associate Pride and Prejudice with The Princess Diaries and other novels of its kind. 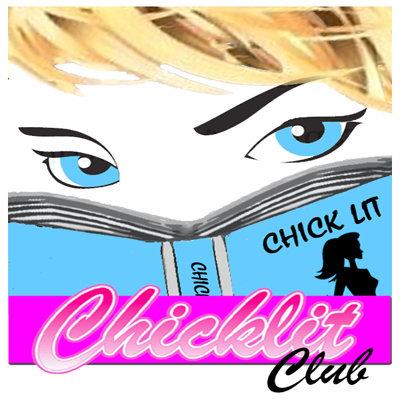 Chicklit Club, an online publication “for anyone wanting to know everything about chick lit books,” illuminates the meaning of chick lit, and how books become designated as such, with its “Review Guidelines” page, which they ask books submitted for review to follow. Books must be “contemporary women’s fiction – mainly chick lit, rom-coms and New adult – as well as non-fiction titles and memoirs” (Chicklit Club). Most importantly, submissions “should be set in contemporary times (from 1980s on) and generally should centre around a female character aged 18 and over.” Though Austen’s Pride and Prejudice cannot technically qualify as chick lit, according to these guidelines, in foregrounding the romantic concerns of the novel and associating Jane Austen with Meg Cabot, a veritable author of chick lit, the cover art imparts the notion that Pride and Prejudice is chick lit or, at the very least, chick lit adjacent. Indeed, Gilbert acknowledges a cover’s power in influencing how a book is seen: “the layered construct provides the sense of integration and a sense of place… to which we open ourselves” (14). In this case, Bloomsbury Classics cover art creates a sense of place and integration for Austen’s novel in the canon of chick lit. While some might argue that Bloomsbury Classics’ cover mischaracterizes Pride and Prejudice, as a capitalist enterprise, their decision to portray Pride and Prejudice as chick lit is justifiable. Chick lit and its loyal adherents are a powerful force in the publishing industry. 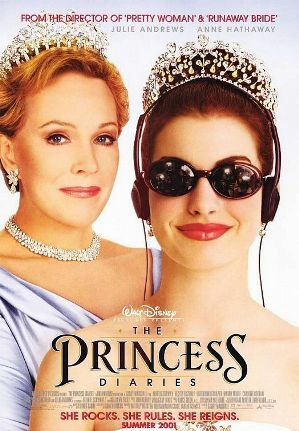 Simply looking at the sales of The Princess Diaries conveys this fact. According to Publishers Weekly, the first of its ten installments sold more five million copies in the U.S. and its sequels have been published in thirty-seven other countries (Lodge). In addition to the myriad copies of books sold, the novel spawned a movie franchise, with the first film alone grossing more than one hundred and eight million dollars domestically (IMDb). Publishers therefore have good economic reason to tap into the selling power of the chick lit canon and draft off the success of other novels like The Princess Diaries. 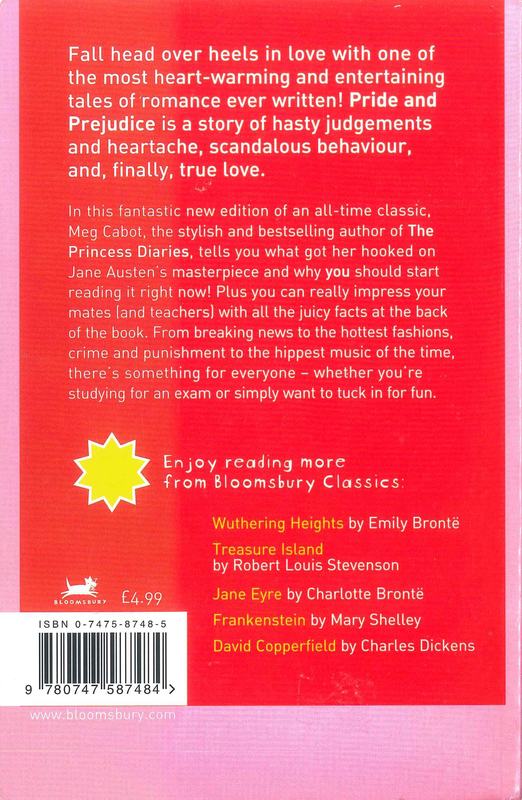 The cover to Bloomsbury Classics 2006 edition of Austen’s Pride and Prejudice conveys much more than the subject matter of the novel – what a cover is traditionally thought to do. The cutesy cover art, the foreword by Meg Cabot, and all the extra goodies packed into this copy, like “Extra! Extra!”, are meant to place Austen’s work within the cannon of chick lit and pander to contemporary literary taste. Further investigation uncovers that this is a common publishers’ tactic and that serious female writers of literary fiction are pigeonholed as purveyors of chick lit. Though Bloomsbury Classics cover is demonstrative of how serious female authors are pigeonholed in the publishing industry, it also, on a more positive note, sheds light on some of the qualities that make Austen’s work timeless and so apt for adaptation. 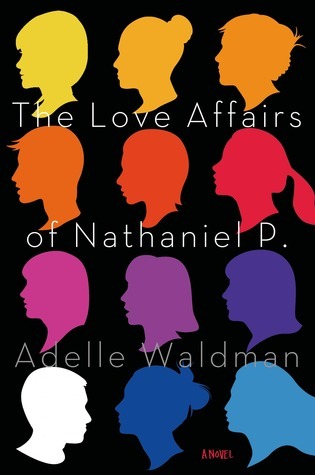 Indeed, her novels contain elements of chick lit and commercial rom-coms, which the cover reflects, but are, at the same time, very much works of serious literary fiction. Fallon, in her Huff Post article, identifies a key feature of chick lit as being, “a plucky, relatable character who triumphs over some obstacles to find a relatable, satisfying conclusion,” in contrast to the challenging prose and “seriously flawed, not always relatable, characters” of more serious fiction. Though most critics and readers think of novels as belonging to one category or the other, Austen’s work has all these elements. Her characters are very relatable, sharp-witted, and engaging, despite being from the nineteenth century, but are also flawed and complex; Elizabeth turns down the marriage proposal of a wealthy, powerful, and handsome man – an unconscionable idea to nineteenth century readers (Austen 147-48). Her prose is furthermore challenging and witty and meets the needs of a more demanding, literary readership. Austen’s work is timeless and adaptable because she straddles the middle ground between more commercial fiction, like chick lit, and serious literary fiction, appealing to a large audience of readers and viewers. Austen, Jane. Pride and Prejudice. Bloomsbury Classics: New York, 2006.